These are pictures of a circ needle storage hanger. The pattern was in an old Interweave knitting mag. I don't know if I still have it. 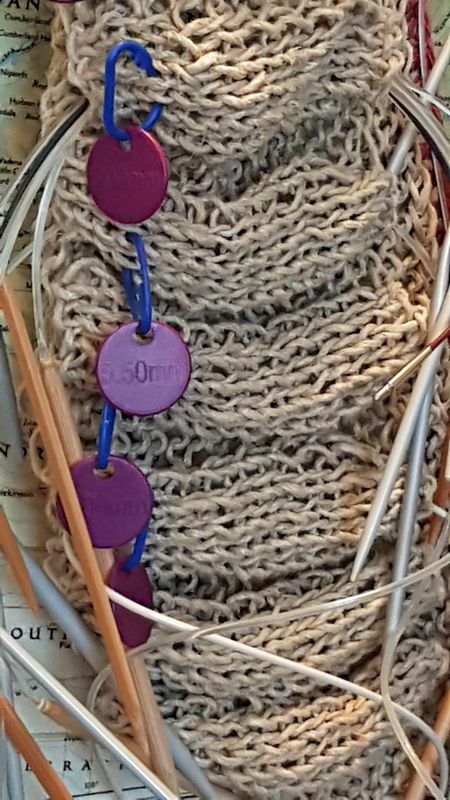 I used Knit Picks id tags to label the slots for various needle sizes. I like the idea of spools though because the they would be easier to slip the needles into and the size label shows up better. Have to think about how to incorporate them. I've made two of these knitted ones. The first one I made out of yarn from my stash and it was too droopy, didn't hang well. This one I knit out of hemp kitchen twine. It was pretty stiff knitting but is holding it's shape better. I only wash it when it gets dusty & then air dry it because it'a amazing how soft even twine gets with washing. Had you thought of sewing this? I did sew one a few months ago from an idea or a pic (don't remember) that I saw here. I just took length of muslin (any fabric will do) and doubled it over. It was almost the width of a hanger. 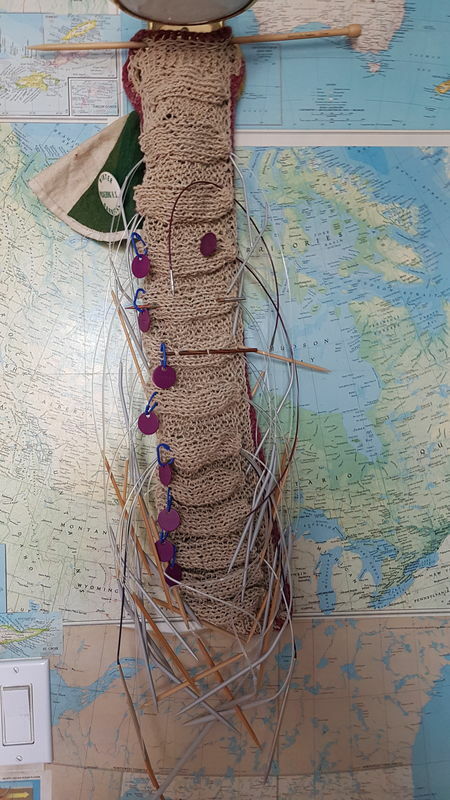 Then I stitched across creating channels horizontally for each size of me circ ndles. It is hanging on the back of the door and very handy. I just wrote the size on each channel since I do have 2 of some sizes. I am sooo not a sewer, the only sewing I have ever done is the annual Halloween costume when my boys were little. Managed to get through hs without taking Home Ec do to various moves while I was growing up. My 30yo son does more sewing than I do! Actually that's a goal now that I'm retired...to learn to sew that is. I don't sew. My circular needles are in plastic pocket sheets in a 3-ring binder. Keeps them neat and well organized. I keep my circulars in their original packaging, in inexpensive zippered make-up bags, sorted by length. If I hung them up like that, my cats would destroy them. This has been addressed before, but worth a rerun for all newbies. I store mine in their original packages because I leave them curled in my palm as I get stitches on. They recurl and back into package and organized and stand in two large vases. Easy, peasy. When I get hooked (no pun intended) on something, I want everything readily available at the ready. No shopping needed. I am the same way about garden tools and hobby stuff. Just an aside to this..I never lend anything to friends or neighbors. Hey! I paid for it, so can they and loaned tools, and such never are returned as lent. That also applies to me. I don't borrow! Meanie..no...sensible or "burn me once shame on you, burn me twice, shame on me! My dogs would have those in a nanosecond! My old cat isn't able to jump that high anymore! As far as leaving them in their original packaging most of the ones shown have too much memory in the cord. Now that I've gotten more serious about knitting & esp circ knitting I'm exploring different brands. I'm pretty happy with knit picks but I'm going to check out some others at my LYS. I use a plastic divider file. I think it has 8 or 10 file pockets. It has worked very well for me. My husband bought me a fabric needle case that rolls. He intended it for my circulars, but I use it for my straights. Both fit my needs to a T.
I agree. I'm glad I'm not the only one that feel the same way. I don't lend or borrow, either.